someone offers me a Tokai Bass for cheap. Here´s a link to a picture what I uploaded by myself, cause i don´t know how to upload pictures in the forum. I only saw the picture the guy sended to me and i haven´t played this bass right now. I don´t have any serial number at the moment. What makes me thinking is the P/J Pickup Routing. 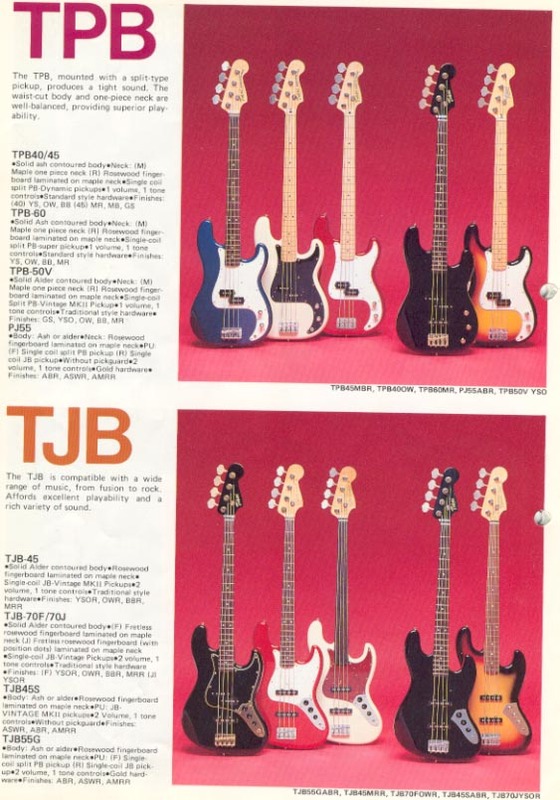 If i google for Tokai P-Basses they come stock with 1 Volume 1 Tone and 1 input jack on the top. If i google for P/J Basses from the Hardpuncher series they come stock with 3 knobs on the top and a vertical input jack. This picture shows a P/J Bass with classic P-Bass eletronics: 1 Volume, 1 Tone, 1 input jack on the top. Could it be a chinese fake? my vsb80m has 1v 1t 1 jack socket with 2 pickups. the picture isn't detailed enough to clarify but nothing indicates it isn't correct so far. best look through all the catalogue scans on this site to see if you can find it.